This is a fantastic frosting recipe, for many reasons. First of all, it is delicious. After that, it is super easy, super quick, it takes no special ingredients, it is pretty to look at and it is very versatile. It is a classic. In a large GLASS OR METAL bowl, put two egg whites, a teaspoon of vanilla extract and ¼ teaspoon of almond extract...set aside. In a saucepan, mix 1 cup of granulated sugar, ¼ teaspoon cream of tartar, dash of salt and 1/3 cup of water. Cook over medium high heat and stir until sugar dissolves and liquid is bubbly. With a hand held electric mixer, this can take up to 7 minutes, but with my stand mixer it only takes about 4 minutes. Recipe makes enough to frost a 9" two layer cake or a 10" tube cake. NOTE: To get these lovely big swirls, use a Wilton tip # 1M...it is a huge tip and will duplicate these swirls with total ease...I promise. Very light, this frosting is a dream to work with. NOTE: The bowl AND beaters that you use, for this frosting, can have NO TRACE of grease or oil on them (or the frosting will not whip properly...right out of the dishwasher is perfect). A big stand mixer, like a Kitchen Aid, works the best, but this can be done quite successfully with a hand held electric mixer too (it just takes longer). NOTE: While this frosting holds up well in all kinds of weather, it WILL form sort of a skin over the soft fluffy frosting if left in dry air for several hours. To prevent this, just cover it if you are not going to eat it the same day. This frosting is a little too soft to use in multiple layer cakes. It is best for frosting cupcakes and single layer cakes. This is one of my favorite frostings for chocolate cake, and is the frosting requested every year for Ole Sweetie Pi's birthday. Your frosting piped beautifully; I'm not clever enough to work with it like that, but now I think I'm going to have to learn to do the fancy swirls with this. I think I have seen this as 7 minute frosting. I have never made this but have always wanted to. I think this would be great on chocolate cake! Coleen....I have made this too and I so agree...tis the best ever! You make yours look so professional though...I could never do that! 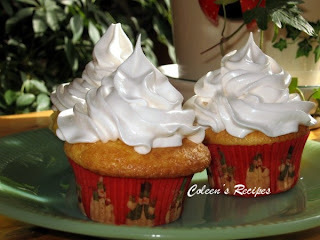 Coleen-that frosting looks so good..I love it piped on....what a perfect topping for those yummy cupcakes. I haven't made a frosted anything for a long time....this has me wanting to get in the kitchen for sure! I have never tried this kind of icing. It sure does look wonderful. Thanks. The frosting on these cupcakes looks so cool! Oh wow they must have tasted great. It is so pretty and shiny. WOW!!! what a FLUFFY!!! frosting, I would LOVE!!! making this and putting on a chocolate cake. THANKS!!! for the recipe. I think it's called swiss meringue! I've heard nothing but good things about it. Looking at your photos I'd say it's all it's hyped up to be. oh i love it! it's so white and fluffy, i can't wait to try this! Hi there, I just found your yummy blog and that icing looks beautiful and delicious! I haven't made a frosting like this in a long time and will have to now after seeing this. It looks delicious! Coleen, you are right this is a classic frosting recipe that has been around forever. Can you believe I have never made it? Your photos are gorgeous and I am inspired to do this with some of my frozen egg whites. I was checking in to see if you had posted any new recipes and still no word - I hope everything is ok. Wishing you well. Oh it looks delicious. My kids would be licking their lips seeing that icing piled so high! Hi Colleen!! I haven't been cooking much lately but I am going to make cupcakes for my hubby's work on Friday and use this frosting! I have a couple questions though... was the frosting just as good the 2nd day or should I try to make it the day of? Also, does the frosting need to be refrigerated or can it sit out on a table? Thanks for your help!! Hi Coleen...iam a first time visitor to your blog! and i must say this frosting looks very silky and perfect...will definitely try it soon ! You keep teasing us with the change in pictures!!! I can't wait until you resume posting. Oh my goodness. This frosting almost looks like ice cream! Ok, I just tried this with ingredients I already had, yep didn't go out to buy a thing, and it is WONDERFUL!!! Light and fluffy yet rich and flavorful!! I am so impressed, really it doesn't get any easier than this one :-) Thinking this will be one I will know from memory in no time!! 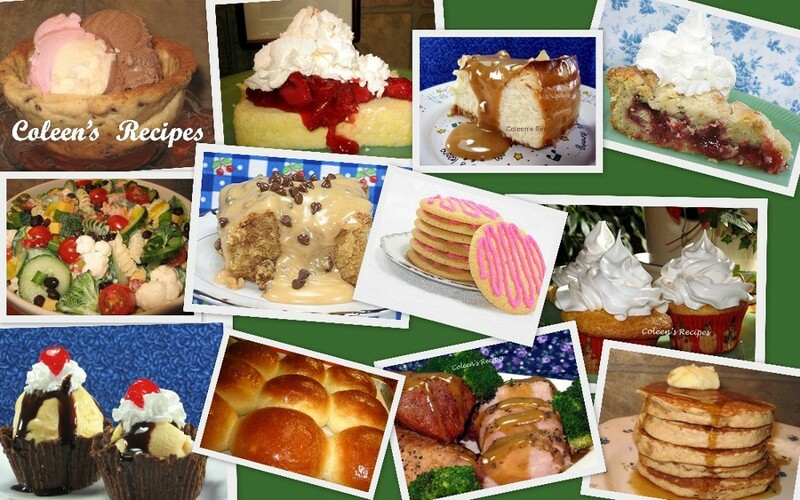 Wow - I found this site and have printed out this recipe..My mom use to make this when I was little and after making it today for a cake I will never buy store frosting again. MY DAUGHTER ,KIR STEN AGE 5 AND MYSELF MADE CUPCAKER FOR OUR DAUGHTER LACIE WHICH IS IN KINDERGARTEN .WE RAN OUT OF CHOCOLATE ICING ! WE (I) PANICED ! KIRSTEN SAYS MOM , DUH WHY DONT YOU BLOG ! ALL THAT MONEY DAD PAYS FOR YOUR STUPID PHONE BILL & YOU FORGET TO USE IT! OH MY GOD MOM , ITS THE INTERNET. THE WORLD IN YOUR BACK POCKET! SO EASY / ALL INGRIEDIENTS ALREADY IN THE CABINET. OOOOHHHH MY GOD. ITS DREAMY .AFTERWARDS WE HAD THE BEST DREAMS IMAGINABLE. LIKE FLOATING ON CLOUDS IN HEAVEN, JUST LIKE THE HEAVENLY ICING. WE ARE ADDICTED. THANK YOU SO MUCH FOR MAKING MY SPECIAL TIME WITH MY DAUGHTER .FUN/ LAID BACK/ ENJOYABLE/AND MOST OF ALL WE COULD LAUGH! hi i made this icing and its now my favourite. its lovely and creamy and not too sweet. for some reason i cant get it thick enough to pipe no matter how long i whisk it. what am i doing wrong??? Hi colleen, I decided to give this icing one last try with an electric mixer(not handheld) and it turned out lovely. I piped the icing on like yours and put a flake in it so it looked like an ice cream. They went down a treat. They were gone in seconds. Thanks so much from Ireland for this lovely recipe. Il check out more of your recipes too. Thank you so much Colleen for sharing this recipe. You restored my faith in the kitchn again! I'm inpired now to do more baking. Bless your heart. 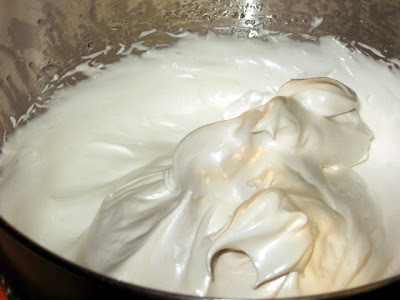 Hi Colleen, This is a recipe my mom has used for over 55 years as her pie meringue. It cooks the egg white and stays nice and she won 1st place in the California state fair in 1960 using this recipe. Folks who didn't like meringue LOVED her pies because of this and it doesn't weep! We have never used it on a cake before, I'll have to try that... The recipe she used come from a Better Home in Garden she got as a wedding present (very old)...a CAKE FROSTING now interesting. Just got to say this recipe is delicious... had a few problems converting to UK measurements at first... ('cups' are an enigma to me XD) but got there in the end! To Anonymous: I really do not have the answer to that question, it never lasts long around our house. I do know that if you let it sit out, exposed to the air, that it will eventually get a thicker "skin", but I don't have any experience refrigerating it. I love this frosting. I always would ask for Nanny's Mayonnaise Cake with Fluffy White Frosting for my birthday. I remember watching her make the frosting and was amazed at what you got from what you put into it! This is an Italian meringue buttercream frosting, no? Haven't tried it but it's on my list. I just purchased Wilton wide tips and am starting to make swirled frostings. I want to try Swiss buttercream also. Both the Italian and the Swiss frostings are so beautiful to look at and so smooth and creamy and delicious. My Mom used to make this when I was a kid 30 some years ago. This is a classic frosting called 7 minute icing. It is wonderful tasting!! i really would like to try this recipe. although some would say raw egg whites are inedible.. hey guys, what's ur stand on this??? Looks great! This topping reminds me of ice cream that I loved when I was a little girl. To anonymous: This frosting should be perfect for your Elmo cake. To Anonymous that is worried about raw eggs. 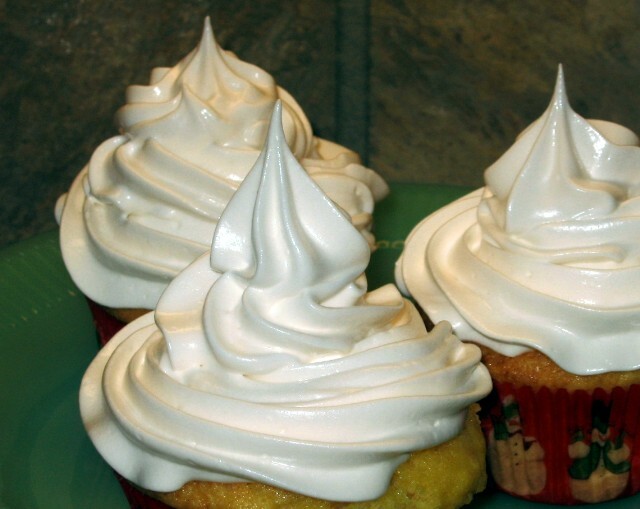 The "raw" eggs in this frosting recipe should be as safe to eat as any meringue, since you put the boiling syrup into the egg whites. I'm trying this on my sons 1st birthday cake! Will let you know how it turns out but it looks yummy! I have a quick question.. If I left these out and a "shell" formed, would the inside of the frosting still be fluffy and light or turn hard? To Me: the "shell" never really gets hard, but it does get a little leathery if left out for a day or so. The interior remains soft. I absolutely love your frosting, it has made my baking life so much easier! I know this seems stupid to ask seeing as the whole purpose of this is to make perfectly white frosting but do you think it's possible to make this icing black? I'm fed up of colouring buttercream and this just tastes so good! Yum............just as I remember the taste of my Mom's. Thanks for sharing. I´ve just made it and in a plastic bowl mixer, excellent results. Hugs from Argentina! My Mom used to make this and it was called 7 Minute Frosting...it was one of my favorites...she used to make for my birthday every year...sweet memories!! what would i need to do to make this into a chocolate? Hello!Is it possible to reduce the sugar to half a cup? Would it affect its piping stability? Thanks a lot! By the way, your site is overflowing with good stuff. Thanks for sharing. From Coleen: I'm not sure WHY you would want to reduce the sugar by 1/2 cup. I've never tried it. Hi again. I tried it using 1 cup sugar. It is not so sweet at all. Just right. It was really light and nice. Thanks again! This recipe is easy and turned out beautifully on the first try. It is absolutely delicious, light, fluffy and not terribly sweet. Thanks so much for providing it!! Coleen, this was my mom's go-to frosting for many years. It was in the Betty Crocker cookbook as White Mountain frosting. Delicious!